We are centrally and conveniently located in a nice area of Louisville just 1.8 miles from I-65 at the Brooks exit 121. Make this your home away from home while visiting the Louisville area. Many attractions located within 8 miles. All sites are full hookup! Come stay in one of our creek front sites. Daily rates starting at $30 a night, weekly starting at $180. We are centrally and conveniently located in a nice safe area of Louisville just 1.8 miles from I-65 at the Brooks (Louisville) exit. Far enough away from the Freeway so there is no road noise. There are 2 nice golf courses within 3 miles! South Park Country Club and The Crossings Golf Course is adjacent to the park. Our park is conveniently located near shopping, restaurants, Churchill Downs, Downtown Louisville, and many other attractions, as well as a gun club that is open only on Wednesday and Saturday afternoons. Many under 8 miles. Come visit and pick up a brochure with many of the nearby restaurants and attractions listed, or contact us and well send you one. 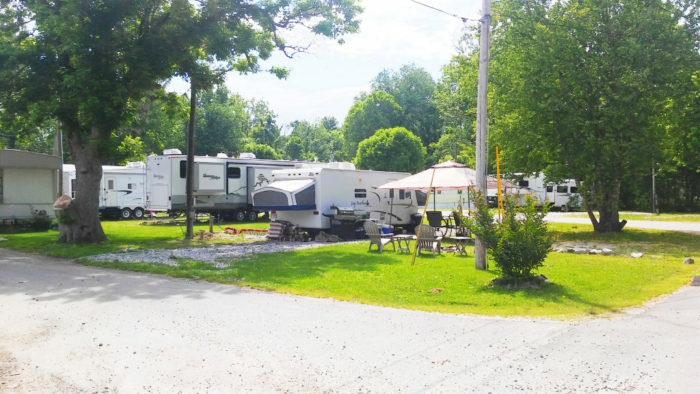 Enjoy the peaceful country setting of this RV park. 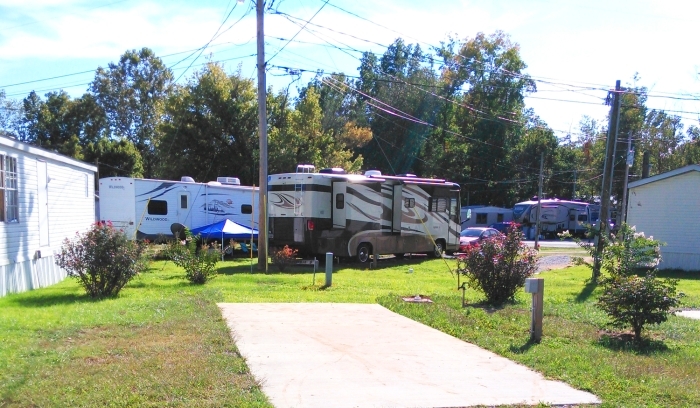 The park has new roads, newer homes, and new concrete pads and RV spaces are being developed currently. This is a big rig park that can handle coaches as large as 50 feet. Because we are conveniently located in the greater Louisville metropolitan area, please know there is a near by train station, local ground transportation, and we are only 8 miles from the Louisville International airport. We do not have bath or shower houses, a pool, or laundry facilities on site. However, there are nice new laundromats and showers within 2 miles. Make this your home away from home while visiting to see the many attractions in the Louisville area, celebrating the Kentucky Derby, Thunder Over Louisville, or for work. All sites are full hookup! Daily rates starting at $30 a night, weekly starting at $180, and monthly rates start at $355 (All rates include tax and electric except our monthly plans. All sites include water, sewer, dumpster service on lot 61, WI-FI, lawn care and monitored security cameras in beautiful and very safe park. We also have creek front, concrete pad, over-sized, and pull through sites available. Some sites are combo sites with creek front and concrete pads or oversized pull through sites. All sites are 50 amp, and we have 50 to 30 amp adapters for a $25 fee. We offer excellent customer service, so please feel free to call if you have any issues! We have an on-site Assistant Manager. Adam’s Office is located on Lot 37, and you can reach him after you arrive by selecting Ext 4 when you call, or look for Adam working in the park. For long term RV guests, we require RVs to be 15 years or newer. We do give variances to some Airstream and restored classic RVs with a picture pre-approval by Management. We are constantly working to improve the property. 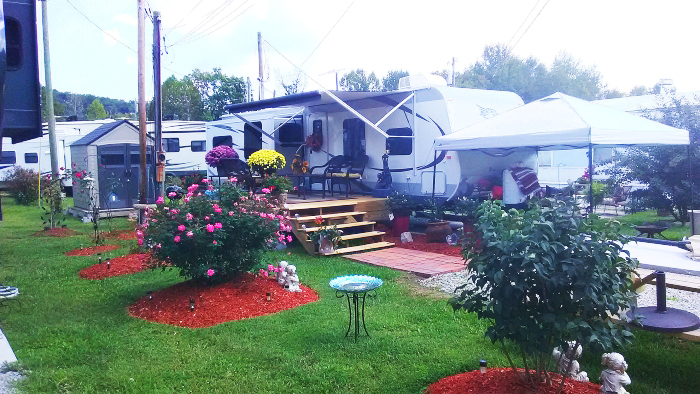 Our mobile home families have all been carefully screened and are great neighbors. We strive to ensure a clean, secure, and safe property. We love to hear from our guests. Please feel free to send feedback to Scott and Dana, the owners. This helps us provide you with a fantastic guest experience.